From Mexico, a speciality naturally manufactured. This Arabica caffeine free SHB, Strictly Hard Bean (cultivated between 1500 and 1700 mt of height), comes from Pico de Orizaba area, which with his 5636 mt. of heights, is the higher mountain in Mexico between the states of Veracruz and Puebla. 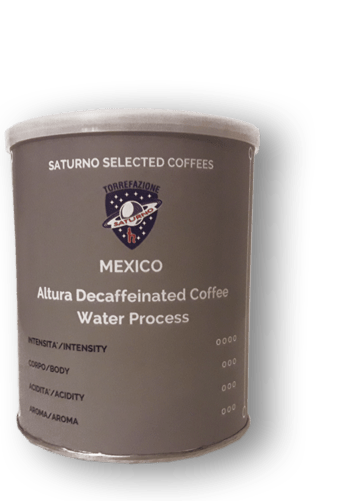 The particularity of this caffeine free coffee, as well as a great achievement in the cup, it is the process of water-decaffeination, without the use of any chemical substances: the green bean gets dipped into pure water coming from Pico de Orizaba glaciers, with the aim of extract the caffeine. With the use of a particular carbon filter, we have the separation of the caffeine from the beans. The result is a biologic product without caffeine at 99.9%, with sweet taste, full body and fruity aromas.